The city is planning to rip down the existing community centre (203 Sackville Green) and spend $20 million for a new facility at the corner of Sackville + Shuter. Here are the tentative plans from the March 10 meeting. 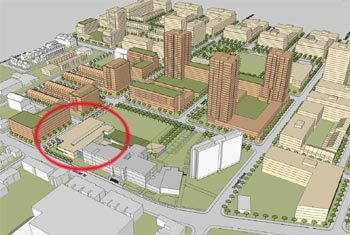 – Schematic Design Presentation: Wednesday April 7, 2010 at 7:00 PM at the South Regent Park Community Centre. This entry was posted in development, recreation, Regent Park. Bookmark the permalink. 1) What does the community center offer for local residents? Please note the words “local” and “residents” in the above question. I hope someone knowledgeable finds time to respond. 1) this community centre is meant for everyone who lives in the vicinity: Regent Park residents as well as persons in the surrounding neighbourhoods. The city’s planning meetings have been an attempt to find out from the local residents want facilities they want in this community centre. 2) the centre is being built by the city. Our city cuoncillor should be the person telling all of us the source of funding. Ask her, then post her answer for all of us to read.